Yahoo says hackers stole information from about 500 million users in 2014 in what appears to be the largest publicly disclosed cyber-breach in history. The breach included swathes of personal information including names and emails as well as “unencrypted security questions and answers”. In July, Yahoo was sold to US telecoms giant Verizon for $4.8bn (£3.7bn). The FBI has confirmed it is investigating the attack. News of a possible major attack on the technology firm emerged in August when a hacker known as “Peace” was apparently attempting to sell information on 200 million Yahoo accounts. The data taken includes names, email addresses, telephone numbers, dates of birth and encrypted passwords. 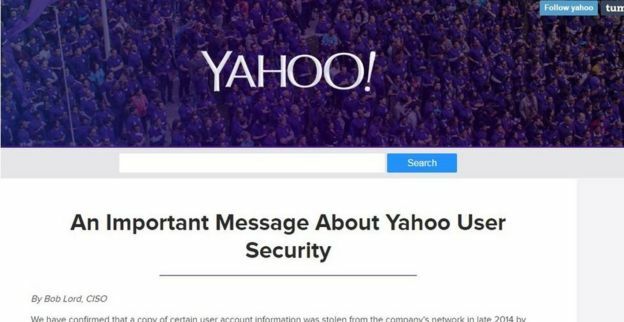 Yahoo recommended all users should change their passwords if they had not done so since 2014. Verizon told the BBC it had learned of the hack “within the last two days” and said it had “limited information”. The company added: “We will evaluate as the investigation continues through the lens of overall Verizon interests, including consumers, customers, shareholders and related communities. Reuters reported three unnamed US intelligence officials as saying they believed the attack was state-sponsored because it was similar to previous hacks linked to Russian intelligence agencies. Questions are being asked about the length of time it took Yahoo to fully acknowledge the breach. “It is really worrying that a breach from 2014 can have gone undetected for so long,” said Prof Alan Woodward from the University of Surrey. “It is also surprising the public statement took so long to appear. “I would have thought most companies had learned by now that early disclosure is better, even if you have to revise and update as you learn more. The scale of the hack eclipses other recent, major tech breaches – such as MySpace (359 million), LinkedIn (164 million) and Adobe (152 million). Yahoo was founded in 1994 by Jerry Yang and David Filo and in its first decade was a pioneer of internet services. It was once the most popular website in the US and the company was worth about $125bn, but Yahoo lost ground towards the end of the first decade of the century, leading to its purchase by Verizon. Verizon’s motivation for purchasing the struggling Yahoo was to simply gain its massive user base. More than a billion people visit a Yahoo-owned site every month, and Verizon was hoping to use that to sell targeted advertising.